You know. I had things to do today. Grocery shopping, to be exact. And, in New York City, when you don't have a car, you really shouldn't grocery shop in the rain. So, instead, I've been catching up on blog stuff (in addition to re-watching The Vampire Diaries and cooking). I have a whole bunch of posts, ready to be shared. But...I'm going to let you see those later. Today, I have a brand new recipe. Like...I just made it. I'm drinking this right now. I figured, if you're having a rainy day too, you deserve a nice little treat like this. 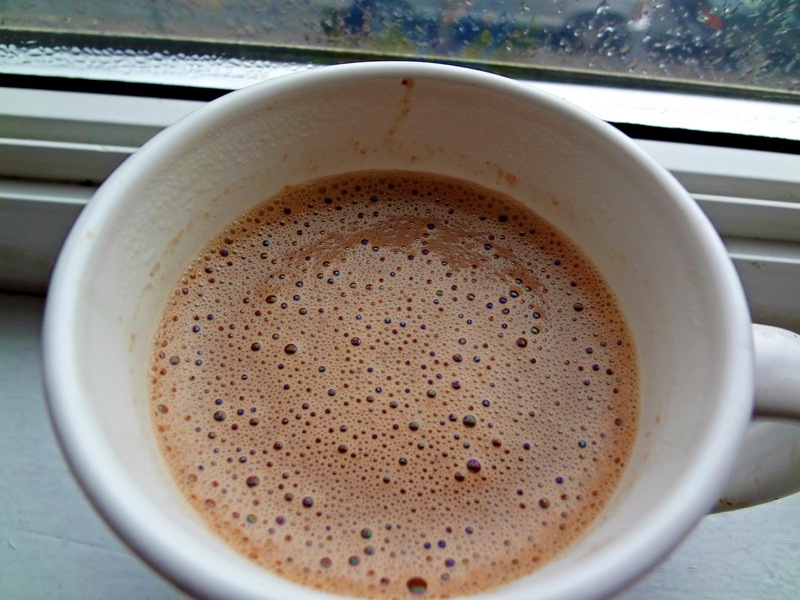 It's not as decadently thick, like I usually go for in hot chocolate. But, the addition of peanut butter gives it just enough richness to keep me satisfied. And, it will please all you people who (for some odd reason) don't like to drink liquid candy bars. Maybe the boy will even like it! This recipe makes just the right amount for one mug. 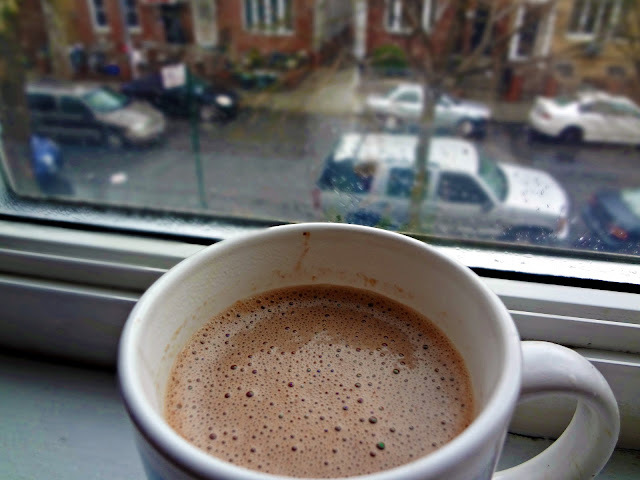 Now-make this hot chocolate, cozy up somewhere comfortable, and read (or watch bad TV...your call). Whisk milk, cocoa powder, sugar, and vanilla in a small pot on your stove. On med-high heat, bring to a simmer. Add peanut butter and stir very well to get rid of clumps. Pour into your mug, and if you want to get fancy, garnish with whipped cream and peanuts (and maybe with some chocolate sauce drizzled over that...mmmm). A hot mix of pb and chocolate, I am definitely going to try this. It is about 70 degrees and sunny but that will not stop me. Thanks for sharing this and sending some sunshine your way! Sounds wonderful! I've been eating peanuts and peanut butter since I woke up, the rain does that :P, I see you're on the same boat! All of your recipes look delicious. Peanut butter hot chocolate? How creative. I'm definitely going to try it. Thanks for visiting my blog; I'm glad you like it. I love your site, as well. I'll be visiting frequently. I'm so glad! Thanks Jennie! Duh! Why didn't I ever think of this?! It's my favorite flavor combo ever. 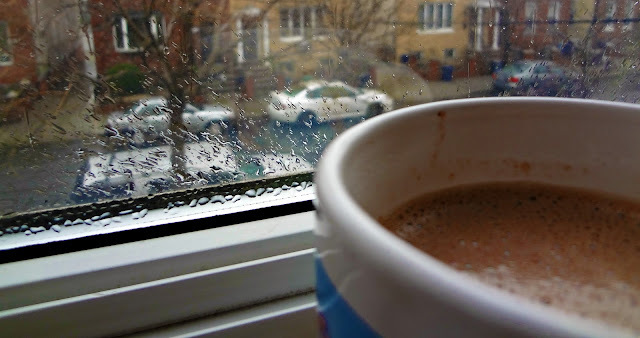 And the pics out your window with the rain make this look even cozier and more comforting. Hope it was an awesome day! I want to try this right now. It is raining and I think you were right with making a warm mug of cocoa. This is the best idea EVER. Yum!! I've never even thought to put peanut butter in hot chocolate, this seriously looks amazing! Thank you so much for linking to the Scrumptious Sunday link party! I will be choosing three recipes and featuring them on my blog and Facebook page this weekend. Will see you again soon! Thank you again! I'd love it if you could link up your drink to my linky party called A Themed Baker's Sunday where this week, the theme is drinks! Hope to see you there! I'd love to!! I just can't seem to figure out how to link up on it?